Easter morning holds a truly special place the hearts of most of us. We love the memories of it, the meaning of it and the moments together during it! This wonderful Easter gift includes: - Plush Easter Bunny, Gourmet Pancake Mix Tote with Mini Metal Whisk, Pecan Praline Syrup, Gourmet Fruit Preserves, Dark Chocolate Smothered Grahams, Milk Chocolate Covered Chips in an Old Fashioned Tote, Apple Crisp Mix, Assorted Chocolate Stir Spoons, Chocolate Espresso Beans, Artisan Baked Tiramisu Layered Wafer Cookies, Artisan Baked Chocolate Layered Wafer Cookies, A Box Of Cappuccino Mix, Wolfgang Puck European Style Coffee, Beautiful Basket With Cloth Liner. 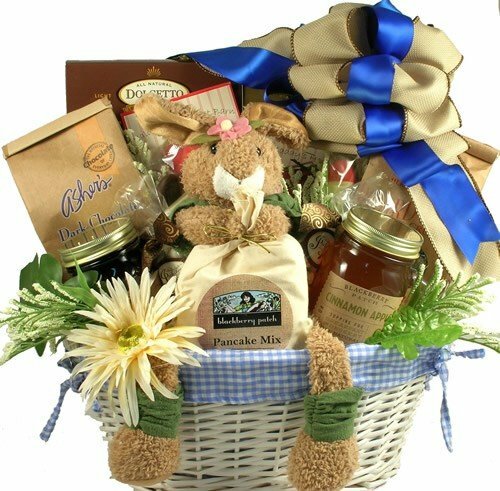 This Easter, help them to celebrate that very special morning by sending a gourmet breakfast basket, right to their doorstep! Include a gift message at checkout for your family, friends or loved ones!